"Is that right, are we dead, and you're angels?" 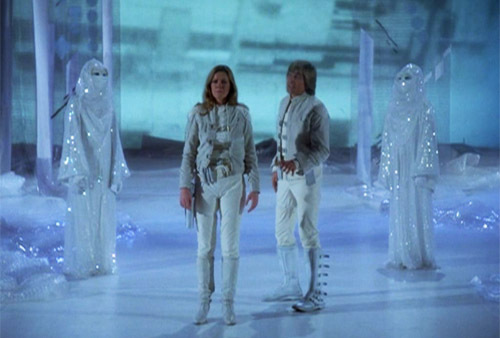 SO SAY WE ALL: The Galactica crew must decide who is an angel and who is a devil. Baltar is captured and Apollo is killed. A little. REVIEW: The serial that makes it clear that the divine intervention stuff of the new BSG was wholly part of the formula of the original series is, not unlike The Living Legend, a story that could have, and should have, been told in three parts rather than two. In the rush to get it told, there's just too much that falls through the cracks. I mean, there's enigmatic (like the true nature of the "angels" in the story), and then there's just frustrating, like just why they were kidnapping Viper pilots in the first place. Or retroactively giving Adama telekinetic powers learned at the academy no one remembered as possible in the previous episode, or whether or not Count Iblis is in charge of the fleet even before he's completed all his "tests". There's shoddy plotting even once you take the deleted scenes into account, and maybe we could have addressed the holes if we'd done away with a second triad game. One ambiguity that I think works in the episode's favor is never showing what was in the crashed ship. Had we seen the corpse of a cloven-hoofed "devil", I would probably have been criticizing it today. Who would that have been exactly? Iblis' former body? Another devilish crewmate? How could these immortals have been killed by a simple crash? And so on. Instead, we're allowed to imagine whatever we want. My first thought was the body of the real Count Iblis, his form taken by the entity to hornswaggle the humans. A better thought was the body of Sheba's father, making Iblis' prediction she would see him again a particular cruelty. Whatever is in there, we're better off for not finding out. This isn't the climax, of course. Iblis tries to kill Sheba but kills Apollo instead (not that that's too clear) and the angels loophole Iblis out of commission. Then they kidnap our heroes and on testing their capacity to willingly give their lives for Apollo, revive the good Captain without a sacrifice. The sequence works well, with strong emotion, and there's some money behind it too, with white versions of their normal uniforms, and of course, the glittery sets and costumes for the angels. When they return to the ship, they've also been gifted with coordinates for Earth, advancing the show's agenda a great deal. We're really heading for the 13th tribe now, and I personally wonder how well BSG would have continued to avoid Gilligan's Island syndrome had it gone to a second season. Because right now, every few episodes has a major move forward, and Battlestar 1980 seems almost inevitable. As we move towards Earth, we shed the Cylons. Baltar has returned to the fleet and he's incarcerated. We don't see the Cylons until the end. What will be his role now, if any? For the life of me, I can't remember, but I hope there is one. Can't wait to rediscover it. Here, he's used to suggest that Iblis has the same voice as the Imperious Leader, and that a thousand years ago, it was the Devil who made the robotic Cylons rebel. Did he destroy their reptilian masters, and cause humanity's downfall a millennium down the line? Interesting. And fun too, given that Patrick McNee not only plays Iblis, but was the voice of the Imperious Leader! Was he cast as the Count for that reason? Or was it scripted that way as a wink TO the casting? Either way, it's a great bit. SPACE DISCO: Iblis' party features some horrifically bad dancing from Apollo, but then maybe nobody can make "rope dancing" look cool. Aside from the discotheque scene, other '70s tropes include the whole Chariot of the Gods vibe, and Adama bending spoons with his ESP training like he's a space age Yuri Geller. ALL THIS HAS HAPPENED BEFORE AND IT WILL HAPPEN AGAIN: The divine intervention of the new series will feature, in its final act, the inexplicable resurrection of a main character and the mysterious transmission of Earth's coordinates. Bob Dylan does not seem to be involved in this timeline, however. In "Hero", we will see the Final Five Cylons, and they will be dressed in threads evoking the angels' costumes. HUMAN DEATH TOLL: Apollo is killed, but resurrected. The fleet gains one human soul, albeit a tainted one - Baltar's. VERSIONS: A deleted scene has Boomer and Starbuck preparing for their Triad match. Another shows more Council deliberations; they give Adama one more day to study the situation before making Iblis president. A third features Apollo et al. returning to the Galactica where they are told the missing pilots were all found on the planet, out of fuel. Strangely, though a scene showing what was inside the crashed ship was apparently filmed, it does not feature on the DVD's reel. All speculation above aside, that scene, the script, and the comic adaptation of the scene (in Maximum Press' BSG #4) show the cloven-hoofed body of a demon. And as previously mentioned, War of the Gods was also edited into a TV Movie, expanded with deleted scenes. REWATCHABILITY: Medium - Some good stuff, but it's so packed, it blows frustrating plot holes through the ship. It's been quite some time since I've seen this, but last time it was on, I'm pretty sure I was more accepting of the things you didn't like. But then again, the way I enjoy old BSG is through a haze of "it's old BSG, you have to accept its limitations". So I'm almost certainly not holding it to standards I might other shows. Overall, I file this episode away as I do the series in general: allegory for big metaphysical / religious concepts. Except instead of the Greek gods this episode, the focus was on Judeo-Christian themes of God vs Satan. And I'm fine with it. Can I just say that I love the Colonial Warrior outfits, both the normal and angelic varieties? They're kind of perfect: flashy without being gaudy. Oh, about what they saw in Iblis's ship: I always figured there was evidence of Iblis doing something inhumanly cruel. Maybe the corpse of someone or something that had been tied down and butchered. I've watched enough "Star Trek" to know that aliens with "devil" traits are not necessarily evil, so it'd take more than an ugly corpse to shock me.